Like many others, I have been captivated (and occasionally caught flat-footed) by some of the emergent national and international trends of 2016 and 2017. While a plethora of economic and political theories account for the underlying causes of the events of the past year, I’ve been curious about how changes in technology in particular are perceived to play a role. Is there a common narrative around how thinkers inside and outside the industry are approaching this question? While I don’t profess to have any answers, I did want to share a summary of some of the positions I’ve encountered as they have helped frame my thinking on the topic of technological innovation. How significant is the current pace of innovation? Interestingly, for what seems like it should be the baseline question for the discussion, there is not a clear consensus on the whether technological innovation is stagnating or accelerating. At the same time, Andreessen notes there are corresponding arguments that tech is overwhelmingly impacting the world, from claims that tech is swaying election outcomes to fears that tech is fundamentally changing jobs and the economy. Which is it? How can a trend be simultaneously dismissed as frivolous while also being feared for its disruptive impact on all of society? Can you quantify the rate of innovation? If there are anecdotes on either side of the argument, are there any clear quantitative indicators? There are many attempts at creating proxy measurements for innovation, but again there is no clear consensus on either measurement or interpretation. One approach is looking at R&D spending, though I’ve previously explored the ways this is a flawed measure for innovation. Counting the number of patents filed as a gauge for innovation proves to be similarly problematic. From an academic perspective, this question often takes the form of exploring productivity growth. The U.S. rate of productivity growth declined by 0.2% in 2016. This is part of a decades-long trend that has shown declines of productivity from around 3% in the post-war era to around 1% today. Why do economists view productivity as a proxy measure for technology? Because technological innovation drives gains on the production possibilities frontier. (Stretching those forgotten Econ 101 muscles! The basics: an economy chooses how to allocate its resources to produce goods, and the only way for an efficient society to increase the output of its production in a non-zero sum way is via technological advances.) Thus decreases in productivity growth rates are in some quarters interpreted as decreases in technological innovation. However, other possible causes of the change in productivity include the difficulty of measuring productivity in an increasingly service-driven society (or relatedly, how GDP measurements fail to reflect standards of living), stagnant corporate investment levels (as evidenced by growing levels of corporate cash), and uneven distribution of digitization across sectors. There are also issues surrounding how we measure the goods we produce. 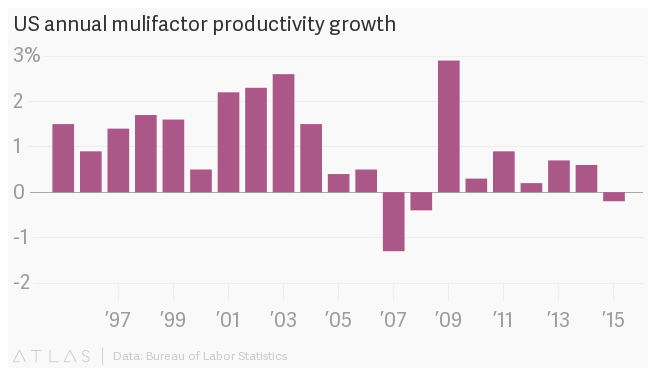 The source of productivity declines remains up for debate. To further confound the issue, there is also the hypothesis that current productivity rates are just a reflection of our return to typical economic conditions. Marc Levinson’s An Extraordinary Time argues that the conditions that led to the post-war productivity boom through the 1970’s were an anomaly, and subsequent decline in productivity rates is less about any of the above rationale but is instead indicative of an on-going economic reality. If there’s unclear consensus on which direction we’re going and how to measure our progress, what is the state of technological innovation? Are we innovating or stagnating? Is there a thread that ties these disparate and seemingly mutually-exclusive ideas together? Here were some approaches to thinking about the problem that resonated with me. How is innovation distributed by sector? William Gibson is credited with the classic phrase, “the future is already here. It’s just not evenly distributed yet.” Part of the answer to the innovation paradox seems to lie in the fact that different sectors and industries are innovating at different paces. Again from the a16z podcast, Andreessen shares thoughts about how to use pricing as a view of innovation in a “bifurcated economy”: there are sectors of the economy (like media, financial services, and retail) that experienced immense innovation in the last decade largely thanks to the internet. This subsequently led to price drops that are good for consumers, though people are upset about the social disruption and disappearance of jobs. Other sectors (like healthcare, education, and real estate) have experienced less innovation but have rising prices; while the job stability and growth is heralded, the public views the increasing lack of affordability as problematic. The order in which sectors are impacted by innovation drives our perception of the value of of that innovation. The categories experiencing the greatest degree of change thus far are largely part of people’s discretionary income rather than necessity spending. As innovation moves more and more into necessities, we are likely to perceive increased value of technological improvements over time. How is innovation distributed socially? Tyler Cowen’s book The Complacent Class hypothesizes that our stagnation stems from “making decisions that are rational and even pleasurable from an individual point of view” but that collectively lead to lower productivity and mobility for society. Cowen views our recent innovative advances as ones that enhance leisure time, and thus lead to a societal complacency. This hypothesis dovetails nicely with the industry segmentation view expressed above. The categories experiencing the greatest degree of change are largely discretionary. Because partaking in these advancements is optional, innovation in discretionary areas is more apt to feel superficial than advancement in necessities. However, this worldview also lends itself to further discussions around class, geography, and other demographic divisions. Is it possible that different segments of society are also experiencing innovation at different rates? Almost certainly. In an interview about their book Machine, Platform, Crowd, Andrew McAfee and Erik Brynjolfsson assert, “even though technology is making the pie bigger, there is no economic law that everyone is going to benefit from it.” A view of income trends in recent decades supports the hypothesis that if we are indeed seeing economic benefits of innovation, they appear to be concentrated at the top. This perspective is not new, and its history dates back centuries. The Smithsonian Magazine’s When Robots Take All of Our Jobs, Remember the Luddites recounts the story of the 19th-century weavers that railed against the machines that replaced them. How is innovation distributed over time? With some exceptions, even the voices that seem more pessimistic about the current state of innovation (like Cowen) seem optimistic about the long-term. Cowen believes that it will take time for the physical world to reshape around the new digital world. “Dynamism and unpleasantness so often come together” and to complete the innovative transition means we must traverse through several decades of uncertainty. This uncertainty is not just social in nature. We also need time for products and businesses to adapt around emergent technologies. Tim Harford says “the most influential new technologies are often humble and cheap.” (A tech corollary is that early waves of innovation that are accused of being a toy.) Innovations on their own are interesting; systems, platforms, and infrastructure around these innovations are powerful. After all, the lightbulb itself was a great invention, but it was not until we had built the infrastructure to deliver electricity that we saw true economic impacts. Per Hartford, it took several decades to see the real benefits of the innovation. The invention itself may be humble in the beginning, but it is the systems we build around these seemingly humble innovations that ultimately drives change. Wow, this is well researched. I think on the income equality I would reference Piketty who did an enormous analysis on income equality in his book ‘Capital in the twenty-first century’. Also in that book, Thomas argues the biggest increase in economics gains come from diffusion of knowledge and skills. The developing economies of China and India have benefited enormously at the game of catch-up. Perhaps they have been the biggest benefactors of smart phones. World wide there are increases, domestically not as much. Robert Gordon believes the rate of per capital output is decreasing over time as revolutionary periods are becoming less disruptive to modes of production. That is, the industrial age was much more impactful than the information revolution. Personally, I don’t want to believe that’s true. I’m hopeful on quantum computing, AI, CRISPR, nouveau nuclear engineering projects…The Idea Factory: Bell Labs and the Great Age of American Innovation show what an R&D powerhouse they were. I think the larger tech companies and tech wealth are tackling similar R&D type efforts that have yet to bear out an impact. Thanks for the reference recommendations, Trent – I’ll check them out! I agree with your comment about being optimistic about the long term state of innovation. It seems like not a day goes by that we can hear about a new type of manufacturing machinery being invented to be able to do things quicker and more efficiently. I know that I sure am optimistic about the future and what that has in store for us.